Ashcroft Barn in Mollington, near Chester sleeps 5 people. 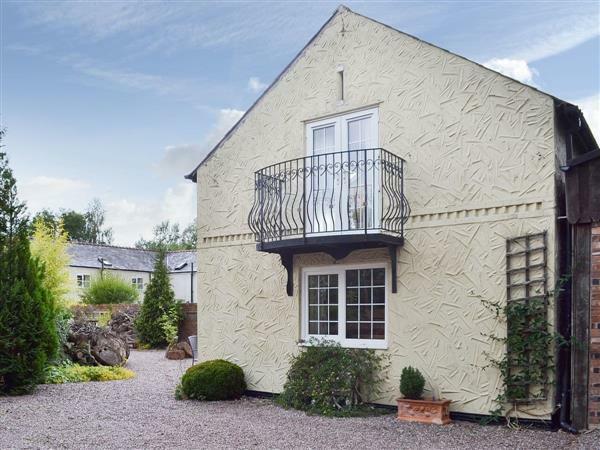 Once part of a working farm, this detached barn conversion provides a comfortable holiday home and is just a few miles from the historic city of Chester. Enjoying a quiet, rural location within the owner’s grounds, the property also benefits from great road access and is close to the main route into north Wales with its beaches. Nearby attractions include Chester Zoo, Blue Planet Aquarium, Cheshire Oaks, and the Boat Museum at Ellesmere Port. For those who love the great outdoors the property provides an excellent base for walkers and cyclists, with dedicated cycle routes and public footpaths from the doorstep. The train station for Liverpool and Chester is 1 mile. Shop and restaurant 2 miles, pub 1 mile. Ground floor: Living/dining room with double sofa bed, beams and wooden floor/kitchen with tiled floor. First floor: 1 double bedroom with additional single. Shower room with toilet. Electric heaters, electric, bed linen and towels included. Travel cot. High-chair. Freeview TV. Video. DVD. CD. iPod dock. Electric cooker. Microwave. Freezer. Courtyard with sitting-out area and furniture. Parking (2 cars). No smoking. Holidays at Ashcroft Barn run from Saturday to Saturday. For a better idea of where Ashcroft Barn is, you can see Ashcroft Barn on the map below. Ashcroft Barn is in Cheshire; should you be on the lookout for a special offer, you can find all the special offers in Cheshire. It's always worth checking to see what is on offer at the moment. Do you want to holiday near Ashcroft Barn (27324), you can see other cottages within 25 miles of Ashcroft Barn; have a look to find your perfect holiday location.